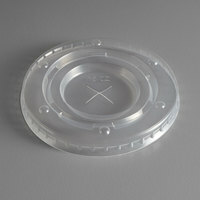 We offer paper cup lids that come with straw slots, so customers can sip on their beverages without removing the lid. Some styles also come with ID buttons that allow your staff to select soda, diet, or other drink options for organization as they prepare patrons' orders. 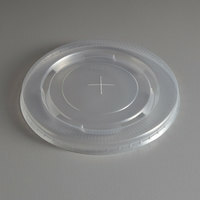 If you serve slushies and milkshakes, try our clear dome lids that provide additional room for thicker refreshments and allow you to fill them through the large hole at the top. Also make sure to check out other great items from Carnival King, Choice and Dart Solo. Use cold paper cup lids to keep any drinks, from soda to lemonade, safely contained in their cups. Customers will prefer these lids if they're on-the-go because they'll prevent liquids from spilling on their hands, clothes, or car seats. Choose from lids with straw slots or dome holes so guests can continue drinking their beverages while keeping them covered. For more take-out drink supplies, check out our take-out cup carriers, straws, and beverage napkins. If you're wondering where to buy carnival king paper cold cup lids, we have a large selection of carnival king paper cold cup lids for sale at the lowest prices.